Displaced (>2mm, >10 degree angulation): ORIF vs CRPP, generally ligamentotaxis reduction and fixation with 6.5 or 7.0mm cancellous lag screws. Treatment is depended on the condition of the soft tissues. Consider spanning external fixation with delayed ORIF when soft-tissues permit for severe soft-tissue injury. Displaced (>2mm, >10 degree angulation): ORIF. Depressed area elevated with bone tamps and packed with graft through fracture site or cortical window and fixation with 6.5 or 7.0mm cancellous lag screws. Treatment is depended on the condition of the soft tissues. Consider spanning external fixation with delayed ORIF when soft-tissues permit for severe soft-tissue injury. 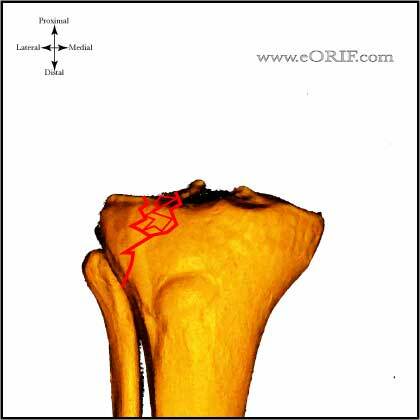 Displaced (>2mm, >10 degree angulation): ORIF. Generally ligamentotaxis reduction and fixation with peri-articular plate with multiple 3.5mm subchondral cortical screws proximally. Incisions determined by pre-operative CT. Plae should be placed with base over the apex of the fracture. Treatment is depended on the condition of the soft tissues. Consider spanning external fixation with delayed ORIF when soft-tissue permit for severe soft-tissue injury. Treatment = ORIF. Generally ligamentotaxis reduction fixation with lateral peri-articular locking plate with multiple 3.5mm subchondral cortical screws proximally. Consider separate medial incision and plating. Treatment is depended on the condition of the soft tissues. Consider spanning external fixation with delayed ORIF when soft-tissue permit for severe soft-tissue injury. Plateau fractures with dissociation of metaphysis and diaphysis. Treatment ORIF. Generally ligamentotaxis reduction fixation with lateral peri-articular locking plate with multiple 3.5mm subchondral cortical screws proximally. Consider separate medial incision and plating. Treatment is depended on the condition of the soft tissues. Consider spanning external fixation with delayed ORIF when soft-tissue permit for severe soft-tissue injury.